Researchers from the U.S. Geological Survey (USGS) St. Petersburg Coastal and Marine Science Center (SPCMSC) in collaboration with USGS Caribbean-Florida Water Science Center (CFWSC) and St. Johns River Water Management District (SJRWMD) investigated spatial variability of bulk resistivity in the Surficial Aquifer located along the Indian River Lagoon (IRL), Florida, USA. Continuous resistivity profiling (CRP) measurements, electrical resistivity tomography (ERT), and hydrologic parameters (for example, depth and temperature) were mapped to investigate submarine groundwater discharge at two locations within IRL. The lagoon extends 200 kilometers (km) along the Atlantic coast of central Florida, varies between 0.5 and 9 km in width, and is characterized by shallow, brackish waters. Both study areas are located along the western shore of the lagoon within approximately 1000 m offshore from the mainland shoreline. Eau Gallie North (EGN) is positioned near the central section of IRL and Riverwalk Park (RWP) is approximately 20 km north of the EGN site. At each CRP study site, an 11-electrode marine resistivity array was towed over seven north-south shore parallel transects (EA-EG at EGN and RA-RG at RWP) measuring roughly 1.5 km in length. Repeat streaming resistivity surveys were collected bimonthly along these same tracklines, between March and October 2017, to determine seasonal and temporal variability. As part of 2017-328-FA and 2017-342-FA, additional stationary electrical resistivity tomography surveys were conducted proximal to the shoreline to further characterize the coastal aquifer beneath IRL. Three shore-perpendicular and three shore-parallel ERT surveys were conducted at both the EGN and RWP sites in May 2017 with the position of electrodes determined by a Real-Time Kinematic Global Positioning System (RTK-GPS). The surveys were repeated at EGN in September 2017 and at RWP in November 2017, using RTK-GPS to place electrodes at the exact location of the May-2017 survey. This data release serves as an archive of resistivity, global positioning system (GPS) and water column data collected in 2017 during USGS Field Activity Numbers 2017-313-FA, 2017-328-FA, 2017-334-FA, and 2017-342-FA. Data products including apparent resistivity, water depth and temperature, geographic coordinates, field notes, and inversion model images (which accounted for salinity and geologic parameters) are provided. Previously collected CRP resistivity data from December 2016 and January 2017 are available at, https://doi.org/10.5066/F7PZ5725. Figure 1. 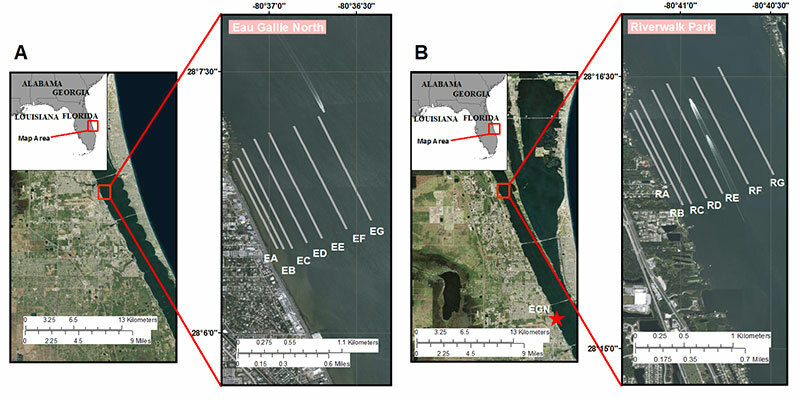 Location map showing (A) Eau Gallie North and (B) River Walk Park study sites, located in the central section of Indian River Lagoon on the Atlantic Coast of Florida. Continuous resistivity profiling data were collected along 14 shore-parallel lines (EA-EG and RA-RG); line EA was not run until July 2017, due to low water conditions. Forde, A.S., Smith, C.G., Zaremba, N.J., and McBride, E.C., 2018, Continuous resistivity profiling, electrical resistivity tomography and hydrologic data collected in 2017 from Indian River Lagoon, Florida: U.S. Geological Survey data release, https://doi.org/10.5066/F7V40TFH.